Washington dictates its policy and orders to African states and heads of state. See the example of Rwanda where the « Voice of America » (*) gives the orders from Washington to the Rwandan people and President (though he was its ally). The peoples are despised and manipulated. American money, the one of the NED, NDI, USAID, Soros Networks, flows. Are we back to the « good old days of the colonies » when the Colonial Office in London, ministries of colonies of Paris or Brussels, Kolonial Amt in Berlin, dictated their imperialist law in Africa? Recolonization of Africa is on. It is time to say no, not the wrong fight, reject cultural reveries, the worship of an utopian past and unnecessary ideas. What interests the Africans is their future! 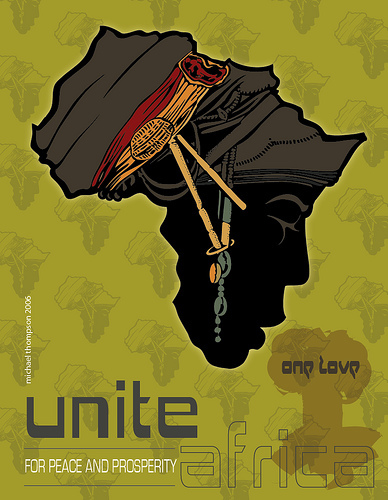 Africa needs first Unity and power, second even more Unity and power and third ever more Unity and power. All the rest are sterile games for impotent politicians. This entry was posted in # ACTU / BREAKING NEWS, * English and tagged Africa, Berlin, Gaddafi, Luc MICHEL, NDI, NED, PANAFRICOM, Recolonization of Africa, Söros, USAID, Washington. Bookmark the permalink.